Tagged with Council of Graduate Schools, Graduate students, US. International graduate applications and first-time enrolment rates declined at US universities in 2017 for the first time in more than a decade, new data from the Council of Graduate Schools has revealed. The CGS report found that for the first time since Fall 2003, application counts from prospective international graduate students declined by 3% while the first-time enrolment of international graduate students declined by 1%. The overall decline was focused primarily in master’s and certificate programs, with responding institutions reporting a 4.8% decrease in applications and a 2.8% decrease in first-time enrolment. 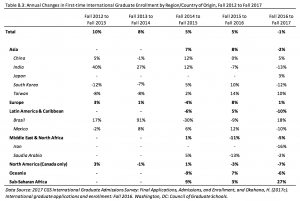 By contrast, first-time international doctoral enrolment grew by 1.8%. Given that 77% of first-time international graduate enrolment was in master’s and certificate programs and 23% was in doctoral programs, the discrepancy is notable. Application and enrolment numbers also saw wide variations by sending country. China and India represented the largest shares of international graduate applications, first-time international graduate enrolment, and total international graduate enrolment. However, the final application and first-time graduate enrolment of Indian students decreased (-15%, -13% respectively) during the 2016-2017 cycle. This is the first decline in applications from India since 2012. 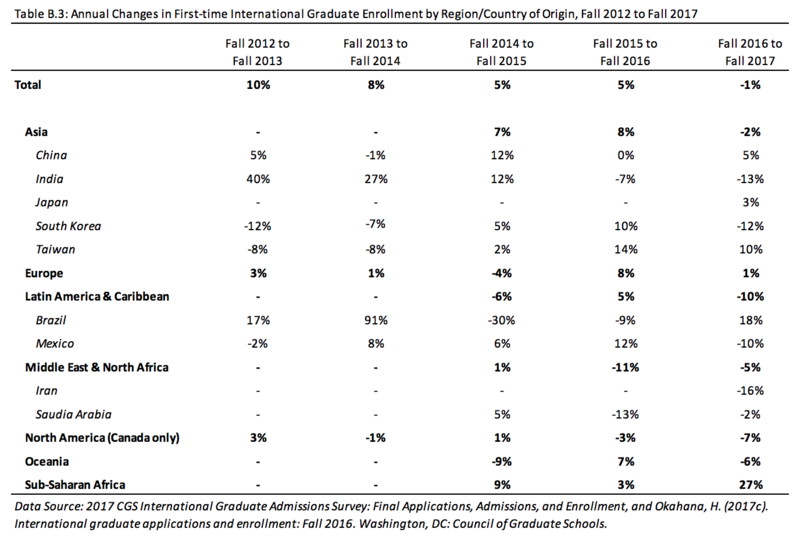 The 2016-2017 admissions cycle also marked the second year in a row that applications and first-time enrolment of international graduate students from the Middle East and North Africa declined. However, first-time graduate enrolment declined at a slower rate (-5%) compared to the prior year (-11%). Applications from Iran and Saudi Arabia – which historically represented the largest share of international graduate students from these regions – dropped by 18% and 21% respectively. CGS reported that applications from prospective European graduate students grew by 18%. However, first-time enrolment of European graduate students only increased by 1% in Fall 2017, compared with 8% in 2016. Changes in immigration policy, including the executive order barring entry or return of US visa holders from specific countries, are being cited as potential barriers to prospective international graduate students. There has also been significant concern that new policies will tarnish the country’s image as a welcoming destination for international scholars. Commenting on the findings, CGS President Suzanne Ortega noted: “while the declines we see this year are concerning, the good news is that the application acceptance rates and admission yield rates are comparable to last year. “This suggests that prospective international graduate students remain highly likely to accept offers of admission to US graduate schools. Earlier in 2018, a report from the National Science Board revealed that international student enrolment in US graduate science and engineering programs dropped 6% in 2017.